Today I'm sharing 5 reasons why you should read this stunning siren-pirate love story ASAP! I read it a few months ago and absolutely fell in love. Get your copy now. Another mention about the South African Bargain Books Warehouse Sale coming up! If you weren't already planning to go, let me tell you right now that you do not want to miss it. There's going be a ton of books at amazing prices and it'll be a bookworm's heaven. A chance like this doesn't come along often. If you live in Cape Town, get down to the warehouse from the 17th to the 20th of December. You won't regret it. Guys, you know how much I OBSESS over amazing platonic friendships. This book serves them right up. Lira has a terrific female friendship with her cousin Kahlia, Elian and Kye's bromance is epic, and Elian's friendships with all of his crew - Kye, Torik, and the absolutely wonderful female pirate: Madrid - are fantastic and healthy and so supportive. I love how they always have each other's backs. Individually, these characters are awesome. Together, they're unstoppable. We don't have enough pirate stories in YA and we certainly don't have many that manage to tick all the boxes. But Christo nails it. She nails the swashbuckling pirate image (with shades of Pirates of the Caribbean, I might add) with the dashing, intelligent, and charming Prince Elian, not to mention his fearsome and totally lovable pirate crew. All of them are vivid, roguish characters. If an epic pirate cast wasn't enough, we also get sirens! The ones in this book are unapologetically dark, dangerous, and seductive, with Lira being the anti-heroine to end all anti-heroines. I also love how we get to see so much of the sirens in their underwater kingdom, and even a lot of Lira's mother, the merciless Sea Witch. Coupled with sublime imagery, the siren world simply bursts from the pages. These creatures are nasty, but oh how they leap to life. Christo's dialogue is magnetic and witty, and coupled with Lira's sass, the exchanges between the two leads are endlessly entertaining. Elian and Lira may spit fire, but with their explosive sexual tension, it's a delight. Elian and Lira's relationship is enemies to lovers done perfectly. They fight, they bicker, they literally begin the book by hating each other.....they are on total opposite sides of this story. But as their relationship evolves in its gorgeous slow-burn way, they start to see each other in a different light. It's beautiful to watch, and it's realistic. There's no insta-love, and their relationship development is slow and clever. It's utterly shippable. This book combines fairytale and folktale lore to create magical worlds above and below the sea. Elian's home, the kingdom of Midas, is just as its namesake implies: a city of gold, a city and a people that worship gold and do their best to imitate the golden theme of the palace itself. There are also the lands of Armonia and Adekaros, and there's Eidyllio, the cool and eerie kingdom of fated love. The grandest setting is probably Cloud Mountain. That's where the climax unfolds, amidst freezing ocean waters and a deadly ice palace. It's just as amazing as it sounds! 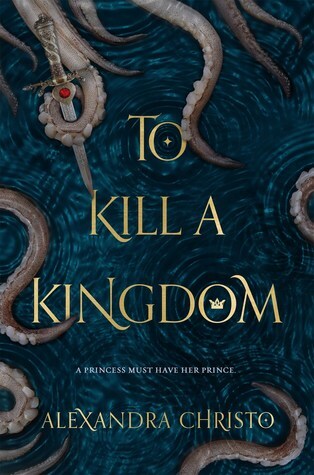 Have you read To Kill A Kingdom? Did you enjoy it? Is it a book you want to read? Are you a fan of pirate stories?